It’s a great time to be in the market for field service management software. There are a ton of great options available for small and midsize businesses (SMBs), and they’re getting more affordable and more advanced all the time. This might explain why 70 percent of field service software buyers we speak with are first-time buyers. Jobber also offers critically important client reminders and arrival notifications. It’s applicable across most every field service segment. While Jobber checks the boxes on all these features and more, it’s certainly not the only game in town. There are plenty of other easy-to-use and affordable field service software options on the market for you to choose from. That’s why we’ve put together this list of the most asked-about and top user-rated Jobber competitors to help narrow your selection. No doubt all five of these options, as well as Jobber, perform many of the same tasks. They also have plenty of key differences that we’ll dig into below. Each system has its own advantages and disadvantages. Therefore, it’s crucial you put in your due diligence when selecting the best field service management system for your new business. The first category of Jobber alternatives includes those field service management systems that are searched for most often alongside it. For example, Service Autopilot is our first most asked-about Jobber competitor because it is searched for the most in conjunction with Jobber in online searches. Just like Jobber (and all the Jobber competitors featured here), Service Autopilot is cloud-based field service software. It offers the three critical capabilities previously listed, as well as an in-depth mobile app with signature capture and camera integration. Service Autopilot also features customizable bidding templates for you to easily get branded, professional-looking bids out for those valuable jobs you want to win. There’s also a nifty online measurement tool that works with Google Maps to generate estimates for lawn care and other outdoor service businesses. mHelpDesk is the second most asked-about alternative to Jobber. It offers the same critical capabilities as Jobber, including work order management, scheduling and dispatch and contact management. 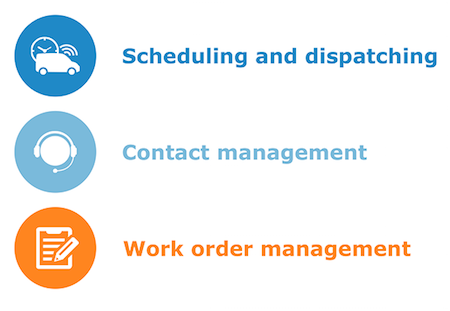 mHelpDesk also offers key automations tied to these and other features. These automations include push notifications sent to mobile employees about job or work order changes, as well as automatic reminders for both clients and employees. mHelpDesk adds value to its system with an equipment tracking component that enables users to record the exact tools and equipment needed for routine jobs. The record can then serve as a checklist for future instances of the same job. The equipment tracker also serves as a way to notify customers about any recalled equipment that’s been installed on their property. Our third most asked-about Jobber competitor is Kickserv. Just like Jobber, Kickserv offers native iOS and Android mobile apps. Along with the critical field service components, Kickserv features a handy marketing component that lets you create simple webpages for customers to automatically schedule appointments. Another unique customer-facing component Kickserv offers is a customer account center. Here customers can review and accept job estimates and quotes, pay invoices and examine records for past jobs they’ve ordered. For the next set of Jobber alternatives, we analyzed Software Advice field service software reviews data to find the top user-rated Jobber competitors. You can check out Jobber’s rating and its many user reviews here. HouseCall Pro tops our list of user-rated alternatives to Jobber. Aside from the critical field service capabilities, HouseCall Pro offers a chat component uniquely embedded into the app that allows co-workers and potential customers to communicate with employees. There is a marketing component of HouseCall Pro that includes free email marketing automation, as well as automatic postcard marketing (for a small fee). These marketing automation features are great for reminding past customers about routine maintenance and also thanking customers for their business post-service. Our final Jobber alternative is ServiceTitan. ServiceTitan offers the same three critical components and also features some unique additions. ServiceTitan’s performance tracking components set it apart from others on the list. It features sales tracking capabilities that monitor how well technicians are winning job bids and upselling onsite. There’s also a phone call monitoring feature for tracking booking conversions and reviewing missed opportunities to train service teams on better on-phone tactics. While Jobber is likely a great fit for your field service operation, there are several other systems that may meet your specific requirements. Explore our field service management buyer’s guide. Here, you can read user reviews from your field service peers and check out profiles for the systems mentioned above and many others. Reach one of our dedicated field service software advisors at (855) 998-8505 for a free needs consultation. They will narrow down your options into a handful of the best systems for your needs.